Hanal Pixán is the name given to the Day of the Dead celebrations of the Maya people who live in the Yucatan Peninsula. The term literally translates as “food of souls” in the Mayan language. 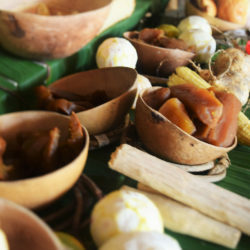 In this region, food takes on a special meaning as traditional dishes are prepared for the spirits who are believed to return on this day to visit their families. The holiday is a way of celebrating and honoring deceased family members and friends. Many of the traditions surrounding Hanal Pixán are similar to Day of the Dead celebrations in other parts of Mexico. The holiday stretches out over three days. Families set up altars in their homes and decorate graves in the cemeteries. The spirits of children who have died return on the night of October 31st, and a special offering is prepared for them, and spirits of adults come on the following night, and there are different items placed for them on the altar. On the third day (November 2nd), a special mass is said for the souls of the dead. You’ll arrive at the Cancun airport. 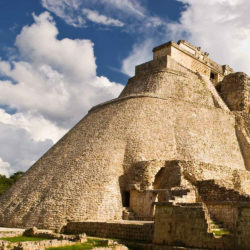 En route to Chichen-Itza, where we’ll spend the night, we’ll stop in charming Valladolid for lunch, then continue to Chichen-Itza, where we’ll begin exploring the concept of death in the Maya world. We’ll enjoy a welcome reception, followed by a presentation on the concept of death in the ancient Maya world. Following, we’ll enjoy the foods from the region, that we’ll later see, take center stage during the Hanal Pixan, “Food for the Soul” observances. Overnight at Hacienda Chichen-Itza. 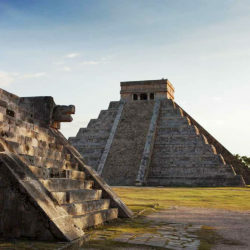 Rising early, we’ll have an incredible opportunity to see the sun begin to rise, as it illuminates the great structures of the late post classic mythical city of Chichen-Itza, land of the Itzá people. By visiting the Tzompantli, or Skull Platform, and the Sacred Cenote, we will learn about the important and necessary role that death and sacrifice had in the ancient Maya world. In the afternoon, we return to the hotel to relax, contemplate or swim. Overnight Hacienda Chichen-Itza. 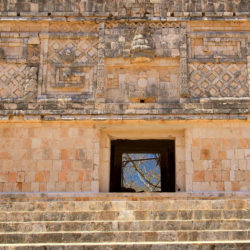 Leaving the world of the ancient Maya behind, we travel towards the capital city, Merida. En route, we visit an important cemetery at Hoctun. Here, we begin to learn about the “syncretism” of the two worlds: the ancient pre-Hispanic, Maya world and the Catholic, Spanish world. 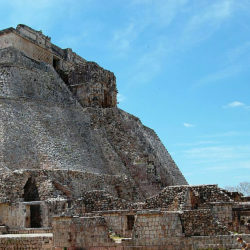 We’ll continue to the Golden City of Izamal, again to see the co-mingling of these two worlds. We’ll have a delicious lunch in Izamal, before departing for Merida, our home for the next 3 nights. 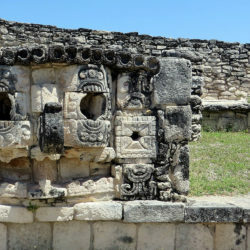 Today we visit the rarely visited site of Mayapan, the only Mayan city that was still inhabited by the Maya people, upon the arrival of the Spaniards in the XVI Century. We’ll see how this site and layout is a small replica of Chichen-Itza. Jumping into nearby cenotes, not only will we refresh in these aqua blue sink holes, we’ll learn how cenotes were portals to the underworld for the Maya people. We’ll then visit the special Maya community of Teabo to meet a family and special artisan. We’ll learn about home altars in living Maya communities, and have lunch on typical and delicious regional foods, such as cochinita pibil and poc chuc in the town of Mani. Return to Merida for an evening at leisure, in this city that is always pulsating with music and dance. Hanal Pixan Altars go on display in the Main City Square (Zocalo) in Merida. Here, the people display their finest assemblies of foods, gourds, drinks, fruits, flowers, decorations, and photos of their loved ones. We’ll learn what each element on the altar represents. Since were staying in Merida, we’ll have time to enjoy this beautiful city known as the “White City”, given the lovely tropical, colonial architecture of this city. Today, we travel to the Puuc Hills region, to see where the Maya of the Classic Period settled in these gently rolling hills. Sites such as Kabah, Sayil, and Labna are in this region. We’ll make stops in small villages and to visit some talented artisans, before arriving to Uxmal, where we’ll relax and enjoy a “pib” style lunch poolside. The rest of the afternoon is at leisure, before we head out at night where we’ll be introduced to Chac, the rain god, as he is beckoned during the Light and Sound show here at night. 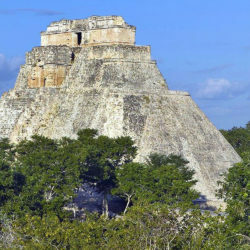 Some call it “campy”, but it is an exhilarating experience to enter Uxmal at night!. Today we will spend exploring the UNESCO World Heritage City of Campeche, characterized by land and sea walls, built to protect it from attacking pirates during the 17th-18th Centuries. We’ll visit the Fuerte San Miguel, an archaeology museum, followed by a lovely meal overlooking the Gulf of Mexico at Faro del Moro. We’ll stop at the State run Craft Store to see and purchase the charming crafts of this region. In the evening, we’ll enjoy “panuchos” at the Portales de San Francisco!